Emotions greeted by transfigured faces, broken down into distinct geometric shapes. Absent and crushed looks, bodies reflected on themselves. The works of Dastgheib convey a strong sense of melancholy, like the people living in those paintings; men lonely, abandoned to their feelings, strong as stormy sea and extraordinarily deep. Deep as the void that their faces transmit, like a chasm in the soul, like a continuous dialogue with their existence, they’re closed in themselves, like people who finally decide to come to terms with their life. Reflections dissatisfied, restless gaits, unnoticed expressions, crooked looks. Who am I? Why me? Must I do it? Maybe or maybe not, maybe I have found peace. The atmosphere that envelops the characters portrayed by the Iranian artist is sad, bored, like the painting that express those faces, introspective and realistically intimate. Dastgheib canvases go through pale colors but cold, clothing and enclosing those men sitting in different positions; Blue with its shades strongly dominates, cold and impersonal blue that intensify already nostalgic tone, and leaves aside that far away and aspired to brilliance. The background on which the figures portrayed stand out is designed by simple and linear geometries, where respectable but sterile colours frequently recur. 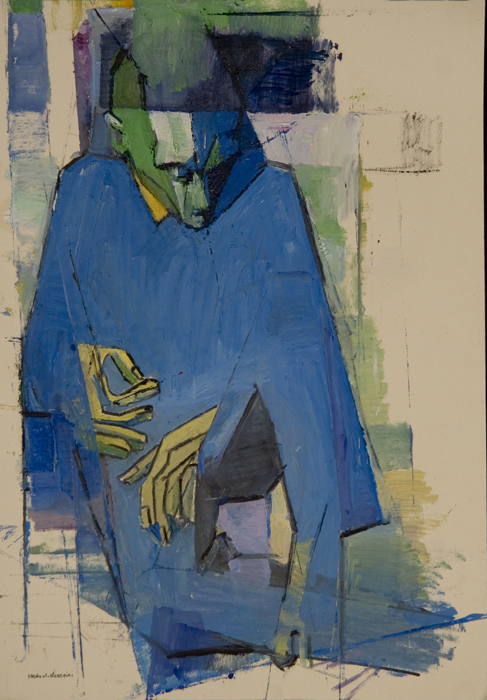 The reference to Picasso’s blue is strong, the color that influenced the difficult and tormented period of the Andalusian genius, as well as the same cubist breakdowns of the volumes, in the bodies and faces of the protagonists; the suffered and troubled positions of protagonists bear the mark of hard inner discomfort. The artist does not just show attitudes or tell stories of those men life, but aims to communicate strong feelings through already weak colors which had been weak; that blue is a source of concern it, is simultaneously the most spiritual color with the same spirituality described in Der Blaue Reiter (The Blue Rider) poetry, by Franz and Kandinsikij, protagonists of the artistic movement active in the second decade of the twentieth century. Embarrassment, meditation and mysticism are combined in the painting of the young artist, who was educated by her mother since she was child, in the study of the art of painting, always searching herself, like “her” male characters. But it is exactly behind those meditative poses that is possible to discover the intimate thinking of the artist; the personification of the modern man stand out of the portrait, besieged from the truest hesitation and from the fear of modernity, attempting to analyze his own conscience. In a society dominated by an already “ruthless progress “, there is no place for emotions, good or bad, but room only on a canvas. And the artist lives of consequence the same nightmare, but differently from those men, she distances herself at the same time that she releases by painting, her emotions, feeling free definitively, like a lightning in the dark. But it is an evanescent feeling, fleeting, like the moment in which the sensation happens, and comes back to bother the soul again unsettled, essential and unavoidable principle of creation.